Every time we come around to this time of the year — when we debate the budget, I swear that the arguments for and against are the same. The same arguments may not come from the same people every year, as it depends on which party is in power at the time. But no matter which party it is, the arguments made by their supporters are always similar to the ones made by the party that was in power the last time. The problem I have with the discussions that take place is that they never really centre on moving the country forward. They tend to develop into shouting matches where both sides put forward arguments that are usually incorrect and myopic. The advent of social media has only served to escalate the divisive and myopic views in many respects. At the end of the day, of course, we have all wasted a lot of energy arguing points that really do not elevate the discussion about how we can develop Jamaica. Last week I visited Antigua for the first time, and I was struck by the fact that the 100,000 or so residents of this small island enjoyed a far better quality of life and seemed more organised than Jamaicans. They have a GDP per capita income of more than US$18,300 and their main industry is tourism, which I was told supports around 70 per cent of the population. Contrast that to Jamaica, which earns significantly more from tourism, bauxite, and agriculture. Yet with a population of three million, we have a GDP per capita of around US$4,000 — a far cry from Antigua. Jamaica is also much closer to the largest global market and has far more air and sea connections. So the question is: Why have we not been able to come close to a small island like Antigua, although we have so many more natural advantages? And even more important, we have 30 times the number of people, which means that we should have the capacity to be 30 times more innovative than Antigua, and when coupled with our significant resource advantages we really should be looking at GDP per capita of more than US$30,000, at a minimum. Instead, we are scraping the bottom of the barrel at just over US$4,000 GDP per capita. As I pondered these things, and as I listened to the Antiguans describe their culture, I began to understand. And anyone who runs an organisation knows that leadership and culture are the two most defining elements of organisational success. Everything else is secondary. I learnt that in Antigua everyone understands the importance of tourism, therefore everyone is in the business of ensuring that the tourists have a great experience. As an example, the group I was with went to visit an old English fort. Another tour guide leading a separate group there came over and offered us some water and drinks from his van, saying that he needed to ensure that he took care of all visitors. In Jamaica, tourist harassment is so pervasive that Sandals had to push forward with a very successful product called all-inclusive hotels. Thank heavens for Butch Stewart. I also noticed that, even though Antigua doesn’t have the infrastructural development that Jamaica does, the streets were spotless. I actually saw a plastic bag on the side of the road and it stood out like a sore thumb because everywhere else was so clean. In our case, when the NSWMA requests $5.5 billion to keep the streets clean and we get $3.6 billion, we are criticised by the same people who cut the budget for not keeping the country clean. Driving on the roads in Antigua is a pleasant experience, as people actually stop at stop signs and stop lights; no one is speeding, and I didn’t see any reckless driving by the taxi drivers there. Contrast that with what goes on here, and we see the vast difference. I also noticed that the environment was quiet, and there was no noise from dances or churches. By contrast, Jamaicans are forced to listen to the dissonant sounds emanating from sound systems and raucous pastors, despite the Noise Abatement Act. Our visit was topped off by the discussions we had at a well-organised symposium put on by the Caribbean Centre for Development Administration (now headed by Devon Rowe, a former financial secretary of Jamaica) on developing a charter for public sector improvement in the Caribbean. We had ministers of government present from nearly every other Caribbean island except Jamaica, of course. Based on the progressive nature of the discussions, I was only too happy not to be in Jamaica and surrounded by the type of discussions we normally have around budget time. 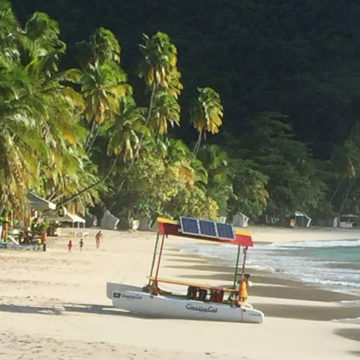 So what has caused this marked difference between a small island that depends on tourism, and Jamaica — a country blessed with relatively abundant natural and human resources? It struck me that what Antigua has done, which we have failed to do, is to create a culture of progress and development. Their people and their environment are geared towards moving the country forward for the betterment of everyone. I am not saying that they do not have their challenges, but certainly the cultural atmosphere that has been drilled into the minds of their people (as evidenced by my interaction) is that they recognize the need to protect their tourism business and create an environment where everyone feels comfortable and can prosper. Hence, their US$18,500 GDP per capita compared to our approximately US$4,000. At the end of the day, therefore, if we are going to reach “5 in 4”, then we must understand that this responsibility — or the ability to do so — does not lie in the hands of a few committees. It can only happen if through our leadership we get the whole country behind the plan. As an example, Vision 2030 must move beyond a concept in a book and in meetings, and be owned by all three million Jamaicans. To do this we must also recognize that the most valuable resource we have as a country is our population of three million residents, and not the natural beauty, music, or sports. Unless we are able to make that transition in our thinking, and our leadership begins to understand the importance of creating that culture, then next year this time we will be having the same discussions we have had for the last 40 years.